A globetrotting entrepreneur entertains clientele in a loft that borrows on the international style made popular in the 1920s: Art Deco. An industrial district in the late 1800s and early 1900s, Tribeca today is one of Manhattan's trendiest neighborhoods. The owners of this apartment, a family of five, actually keeps two apartments in Manhattan, but this Tribeca loft which was built in 1922 as a warehouse, is used primarily for entertaining his international business clientele. On any given evening, celebrity chefs and caterers will be in the galley kitchen whipping up dinner and hors d'oeuvres for up to 200 guests. Karen Williams of St. Charles of New York, set out to maintain and celebrate the apartment's provenance by incorporating the exposed ductwork, I-beams, concrete floor and even electrical fittings, then bring in details with a grand scale and 1920s zeitgeist. Ribbed glass, quarter sawn oak, stainless steel and powder-coated metal cabinets add to the industrial story, while the tall ceilings display the family's art collection. Above the 11-foot island, 27-inch diameter globe lights channel the Art Deco period, an international style invented during the 1920s that was informed by another 'new' phenomenon: the machine age. 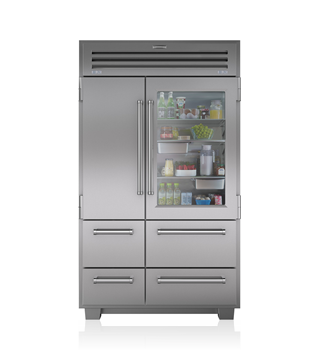 "The most important selection in the kitchen was the Sub-Zero PRO-48 refrigerator," says Williams. "It's professional, commercial and still high-end design. It exemplified what we were trying to create and almost could have been here from the original time!" Sliding stainless steel doors with frosted panels are closed when caterers work there, but when a celebrity chef is in the house, doors are swung open to become part of the dining area. 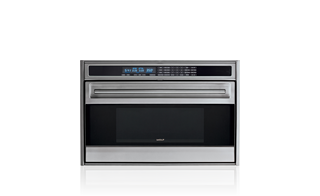 A chef's cooking center integrates four burners, double griddle, induction cooktop and electric grill. "The Sub-Zero, Wolf, et Cove were selected for their versatility, professional quality," says Williams. "They're also user friendly for the family, who personally love to cook."